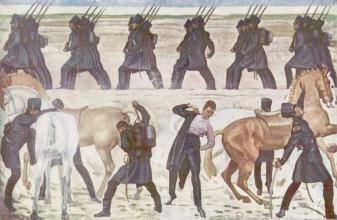 Ferdinand Hodler (March 14, 1853 – May 19, 1918) was one of the best-known Swiss painters of the 19th century. 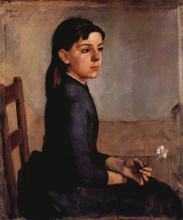 Hodler was born in Berne but moved to Geneva at the age of 18 to start a career as a painter. Hodler's early work consisted of landscapes, figure compositions and portraits, treated with a vigorous realism. In the last decade of the 19th century his work evolved to combine influences from several genres including symbolism and art nouveau. He developed a style which he called Parallelism, characterized by groupings of figures symmetrically arranged in poses suggesting ritual or dance. 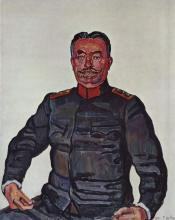 Hodler's work in his final phase took on an expressionist aspect with strongly coloured and geometrical figures. Landscapes were pared down to essentials, sometimes consisting of a jagged wedge of land between water and sky. However, the most famous of Hodler's paintings portray scenes in which characters are engaged in everyday activities, such as the famous woodcutter (Der Holzfäller, Musée d'Orsay, Paris). 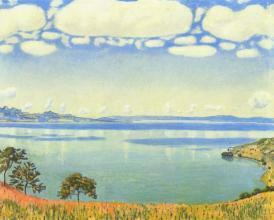 This picture went on to appear on the back of the 50 Swiss Franc bank note issued by the Swiss National Bank. 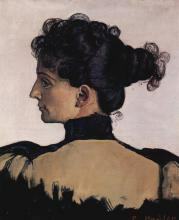 In 1889, Hodler married Berthe Jacques. In 1914 he condemned the German atrocities conducted using artillery at Rheims. 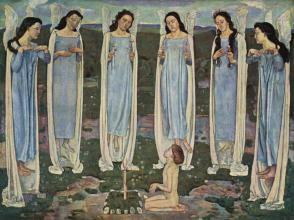 In retaliation for this, German art museums excluded Hodler's work.